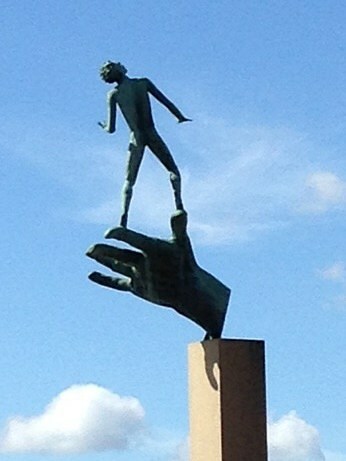 I am always apprehensive when I visit sculpture gardens. Some of them are a collection of ad hoc unrelated works by up-and-coming sculptors, others are grand and often disparate collections of world famous artists put together by committees, and a handful I find interesting and exciting. These are usually sculptors’ gardens filled with their own work which gives them a greater sense of coherence. Of course, sculpture is emotionally subjective and you have to like what you see. 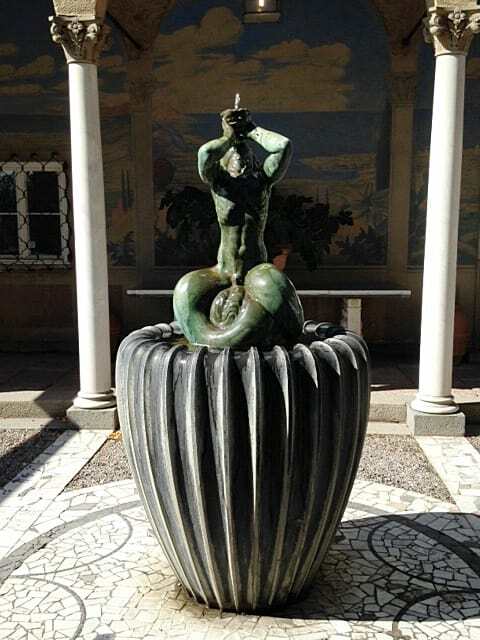 It was on the strength of one photograph of a sculpture in the garden of Carl Milles that I visited Millesgarden, a five acre (2 ha) garden, located on a high bluff overlooking Lake Vartan on the island of Lidingo in Stockholm (sadly the spectacular view now marred by gargantuan cruise ships). 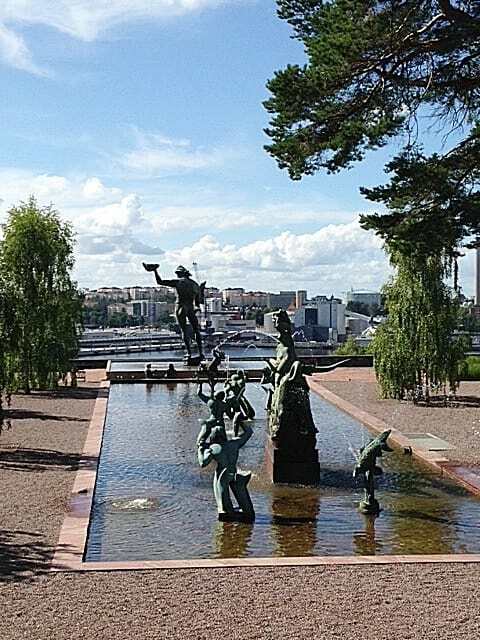 It features over 200 sculptures many set on posts, columns and in fountain pools, a collection of antiquities, the artist’s house and an art gallery. 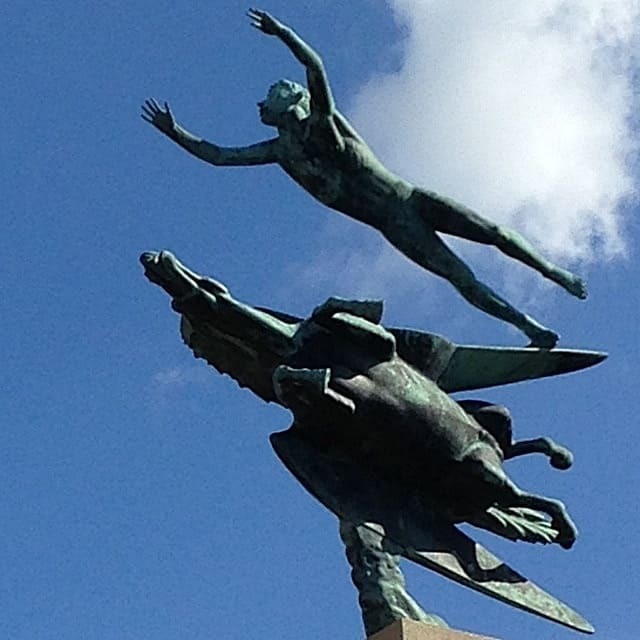 I have to admit my ignorance in that I knew nothing about Carl Milles. He trained as a cabinet maker and ornamental carver in Stockholm and was given a grant from the Swedish Handicraft Society. This led him to Paris in 1897 where he studied anatomy at the Ecole des Beaux Arts, worked in Auguste Rodin’s studio and met his wife, Olga. In the early decades of the 20th century he became internationally famous and successful, which enabled him to add adjacent properties to his modest house and studio in Lidingo. The steeply falling site, black and white marble paths, use of architectural fragments and reclaimed columns give the garden a Mediterranean feel but the planting of pines and birch make it a delightful hybrid anchoring it back in Sweden. Development of the garden stopped in 1931 when Milles was approached by George Booth, the American newspaper magnate and philanthropist, who asked him to become the sculptor in residence at his school of architecture, art and design at the influential and highly-respected Cranbrook Educational Community in Bloomfield Hills, Michigan. His American appointment led to many interesting commissions, and bronze copies of the sculptures are to be found in the garden. 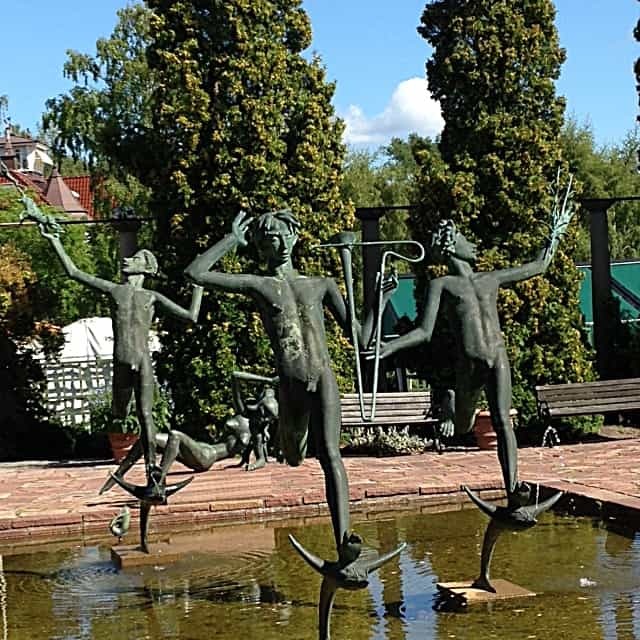 It was at this time that Milles established a charitable foundation donating his house and garden to the Swedish nation, and it opened to the public in 1936. 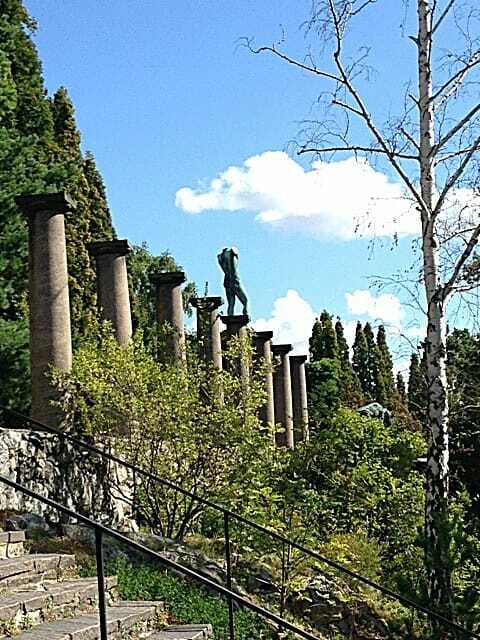 He returned to Sweden in 1950, and for the last five years of his life spent his winters in Rome, and his summers at Millesgarden continuing to develop his garden. The Lower Terrace, was created in 1950 as an expansive paved Italian-inspired piazza with fountain pools and sculptures, and intended to be a place where people could meet rather than a formal sculpture park. The proposed ice rink and swimming pool were never built. A grandiose monumental stair leads to the upper terraces, but throughout the garden there is little planting of interest other than block-planting of linseed and yellow clover in the Kitchen Garden. 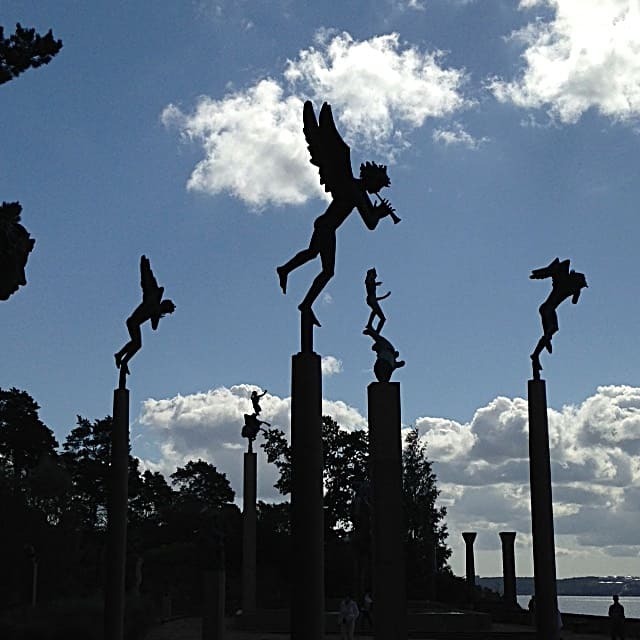 Milles’ other great passion from a small child was astronomy, which may explain why many of his sculptures are set high on columns so they are viewed from below, with the sky as background, giving the impression that they are in flight. His sculptures have a wonderfully playful quality, and despite his formal Beaux-Arts training, are not gods from antiquity or subjects having the gravitas of Rodin, but skinny urchins with mischievous faces.